National brass band champions of Ireland for eight of the last 10 years, Drogheda Brass Band is delighted to announce it is recruiting for a class of beginners. We want YOU to join our brilliant school of music and take part in fun competitions, perform grade exams through the renowned Trinity Guildhall in London and join our highly successful Drogheda Youth Brass. Brass Band Bugle, the newsletter of Drogheda Brass Band, returns this month as a digital-only offering. Click on the link below to view. All feedback welcome to brassbandbugle@gmail.com! 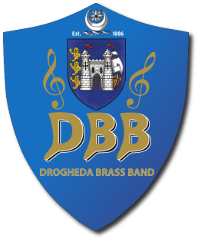 The Drogheda Brass Band is recruiting both brass and percussion players. The brass class will run from 4-5 on Saturday afternoons. In this class students will be taught and play in a group. The percussion class will run from 6pm on Wednesday evenings and will be taught on a 1:1 basis. Click on the link below to read the April edition of Drogheda Brass Band's newsletter - the Brass Band Bugle - with a special four-page section on our victory in Navan at the National Band Championships. The Drogheda Brass Band’s annual slow melody solo contest was held at the band’s premises at East Coast Business Park last Saturday. Forty-two players took part in the competition, which covered the under-12, under-15 and under-18 age groups as well as a new open section for the adults. Adjudicator for the contest was Brendan Breslin, conductor of Ardee Concert Band, who complimented the high standard of performances on the day. Drogheda Brass Band has repeating the extraordinary feat of being champions of both Northern Ireland (Grade 2) and the Republic at the same time. Their latest success saw them scoop the National Championships of Ireland in Navan last Sunday and regain a title they lost last year, having won it for the previous six years in a row. And in a few weeks’ time, the local outfit will represent Ireland at the European Band Championships which are being held this year in Perth, Scotland. Read more about New Class Starting!! The DBB were crowned NIBA Grade 2 Champions in Armagh's Market Place Theatre last Saturday. The band also claimed the best Cornet Section prize while conductor Michael Maher picked up the conductors prize. The band has won 8 Championships in 7 years (6 IABCB and 2 NIBA) which is an incredible achievement however Saturday’s victory is particularly special considering the large number of young players who took to the stage.